Congratulations to the winners of the Mosman Art Prize 2016, an annual, acquisitive award for painting sponsored by Mosman Municipal Council. The winners were announced on Tuesday 23 August 2016 and the works are on exhibition at Mosman Art Gallery from 20 August to 25 September 2016. On Sunday 25 September at 3.00pm the Mosman Art Prize will be closing early so that exhibiting artists can pick up their artwork from 3.00pm – 5.00pm. Watch the video that features winner Michael Zavros and Prize judge Susi Muddiman talking about the winning work Flora. Flora forms part of an ongoing body of work about my eldest child Phoebe, aged 11. I have been drawing, painting, photographing and filming her almost since she was born. In 2010 I won the Doug Moran Prize for my portrait of her entitled Phoebe is dead/ Alexander McQueen. My Phoebe project has emerged as an increasingly central part of my broader practice. She is my muse, but also a surrogate me. In some ways, my portraits of her function as self-portraits: me outside of myself. As she changes and matures, the work changes too. In Flora, Phoebe wears a vintage 1960s Gucci scarf, the famous ‘Flora’ pattern, which depicts European spring blooms, butterflies and insects. Like traditional still life or vanitas painting the flowers present a momento mori, and mark the passing of time and the first flush of youth, on the verge of puberty. 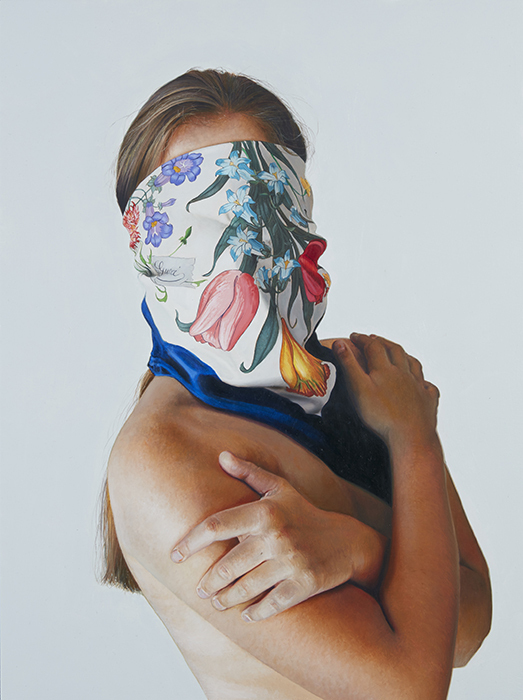 The scarf covers her face although she seems to be holding the viewer’s gaze. I enjoy the simultaneous references to fashion photography and classical portraiture, this blending of the sacred and the profane. My paintings explore the genre of romantic landscape painting which has a deep emotional response and engagement with the mysterious and shifting Australian landscape. ​I am interested in capturing nature's transitional moods in a suite of breathtaking Australian landscapes, engaging my senses with the emotional and aesthetic qualities of the land and sky that echo human moods. 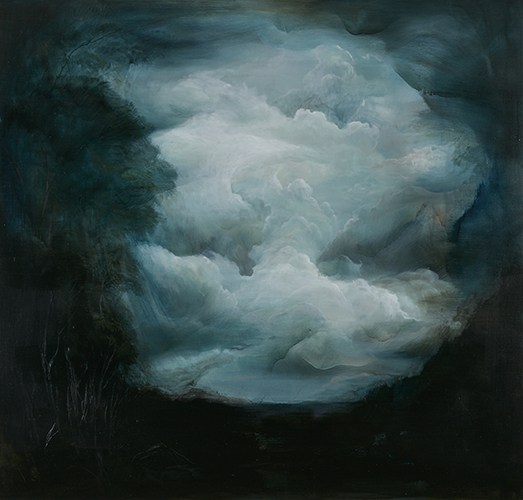 ​The painting, Cloud In abstraction(2016), I created a dramatic interplay between light and dark (chiaroscuro) as defined branches and dark trees frame the foreground, directing the focus to gigantic moving clouds or gusts of wind as the sky and land create different energies. 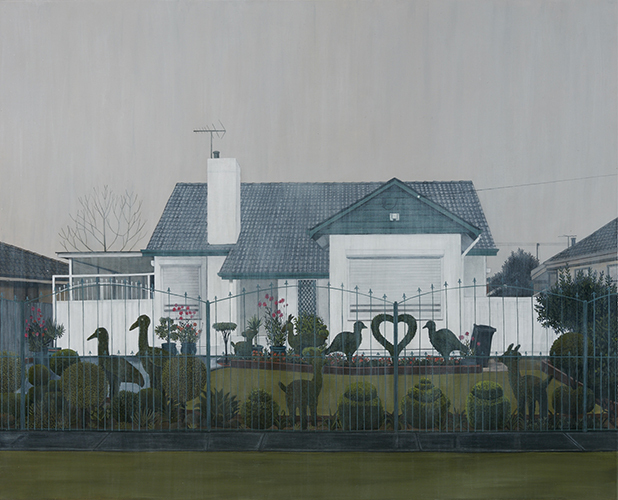 ​Another aspect to my work is dealing with the idea of passing time and the fragility of memory through nature. The physical elements and forces of nature are interdependent in an atmospheric landscape and the experience of nature’s transformation is balanced by a deep, physical connection to place. Other people’s houses have always fascinated me. Although outwardly many houses are generic, I am intrigued by the way people, in creative and resourceful ways, express themselves within the boundaries of their own environments. I am drawn to a subtle and quirky aesthetic: one that includes the design elements of colour, symmetry, pattern and balance. The promise was inspired by an actual house and garden I saw many years ago set amongst the sprawling outer suburb of Sunshine West in Melbourne. To create the composition I played about with the placements of the topiary and left out many of the actual ornaments (including many carefully placed garden gnomes). The day was grey and drizzly, which is not uncommon for that part of Australia, and gave a soft gentle atmosphere to the garden. 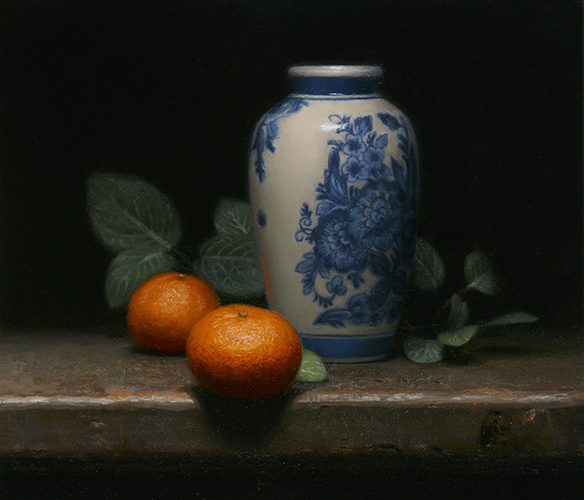 Mandarin still life is inspired by the classical realistic paintings from the 18th to 19th century. The dark background, which is a characteristic of the classical style, creates visible depth in the painting where the objects are emerging out from the darkness. Academic painting techniques were used in order to create a convincing illusion of three dimensional form and to represent the quality of the surface texture of each objects in the painting. The word “Mandarin” has a plurality of potential meanings. The word could refer to the orange mandarin fruits or it could be referring to the Mandarin Chinese style of the vase. Furthermore the word “Mandarin” also has a little-known meaning of “elegantly refined, as in language or taste.” The moral of the painting is to capture the beautiful co-existence of objects which are seemingly world-apart from each other; perhaps "mandarin" may be an appropriate adjective for describing the composition of the painting. Talented young Japanese artist Moritaka (Toko) Suzuki has been voted winner in the Mosman Art Society Viewers Choice Prize. At only 24 years of age Suzuki has also won the Fourth Village Providore Emerging Artist Prize. With over 450 Viewers Choice votes counted his painting Mandarin Still Life was a clear winner. The artist also sold his work on the first day of the exhibition and we look forward to hearing more about this talented artist in the future.